Davena Gentry has been keeping the Bay clean at Bedwell Bayfront Park in Menlo Park for the past five years. As a realtor by day, Davena incorporates her love for the environment into her career, and has earned a Green Designation from the National Association of Realtors. She enjoys educating children about how litter flows downstream, where it often originates in creeks and streams before reaching the Bay and ocean. 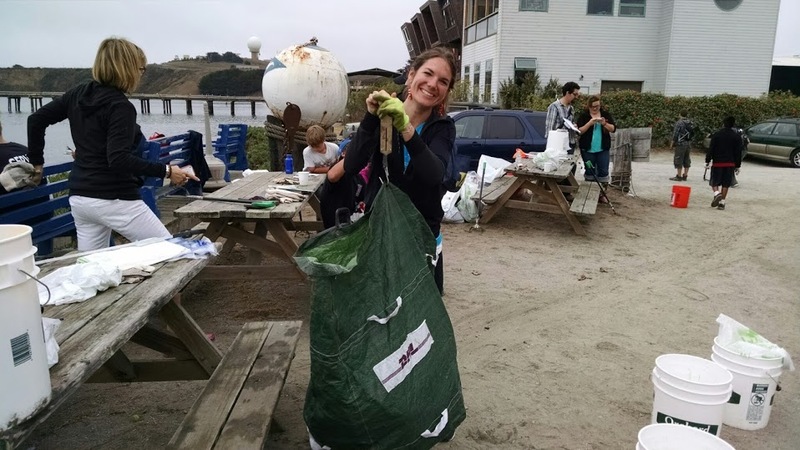 Join Davena and many other earth heroes on Coastal Cleanup Day – Saturday, September 16th. Visit smchealth.org/ccd to find one of the 30 Bay or coast cleanup sites in San Mateo County! 2016 Coastal Cleanup Day is Another Success! Volunteers at Poplar Beach in Half Moon Bay ready for a cleanup. Last Saturday thousands of volunteers showed up in San Mateo County to clean up litter on shorelines, beaches, parks and neighborhoods in honor of Coastal Cleanup Day. From Brisbane all the way down to Pescadero, over 3,871 volunteers of all ages showed how much of a difference one event can make. In just three hours volunteers collected an estimated 22,299 pounds of trash and 3,754 pounds of recyclables from over 33 sites on the bayside and coast by climbing hills and even wading through water! For a few volunteers it was worth it because they were lucky enough to uncover a few of the most unusual items of the day, such as a backpack full of crabs in Half Moon Bay and an old police radio in Burlingame. There are over 30 locations in San Mateo County to help clean up! Join us on September 17th 9am-Noon to participate in California’s largest volunteer event that helps clean up and protect our beaches, shorelines, creeks, neighborhoods and parks in San Mateo County. These locations have historically been collection spots for trash and debris, and if not removed, can be harmful to marine wildlife and human health. Volunteers at Mirada Surf in El Granada. Once again, San Mateo County residents came out by the thousands to clean up trash around the county on Coastal Cleanup Day, which took place Saturday, September 19. Residents on both the coast and bayside of the county slogged through sand, waded through mud, and climbed hillsides with buckets and bags, trash pickers and gloves, and a whole lot of spirit. Young and old participated as groups of friends and families turned out to make a difference in three short hours on the hot and sunny day.